In the Fall of 2013 Hurricane Sandy hit the East Coast. The shore towns of New Jersey were damaged, washed away, and are still recovering. Just take a drive down those South Jersey shore towns and you'll see. 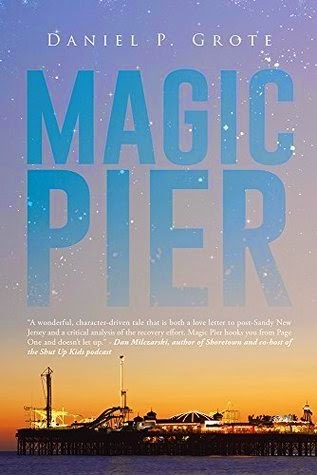 In this book, Magic Pier, Drake Garrison is a real estate attorney but is torn about doing his work at the law firm and helping to re-build the pier in Seaside Heights where he worked as a young boy. His wife is due with their first child, politicians are playing games as to who gets relief funds to rebuild the shore, and Drake is trying to manage it all. Meeting with Washington D.C. and local politicians to channel funds to SeaSide Heights he finds himself the keynote speaker at a few events. People feel his passion for the pier. Perhaps Drake feels the passion a bit too much when he leaves the court room just before a trial to go to the pier and help move the Tilt A whirl. The partners at his law firm request a meeting with him after his stunt of leaving the client with out an attorney present. They don't offer him a seat at the meeting, just a box to collect his belongings. By this point he has been working full time at the pier, while Rusty the owner is recovering from a heart attack in the hospital. Drake's wife Stefanie asks him for help to paint the baby's room and to be around more to help her. Drake can't seem to make a commitment to helping her because he's become so engulfed in the pier repair. Stefanie has gone away for a week-leaving Drake to sort out his priorities-or so she thinks. His working at the pier is consuming his time until two of the old workers are back helping Rusty. Drake is offered another job at a law firm and accepts. The baby is born, Drake is employed. What could be better? Drake is able to take his son to the Magic Pier excited to share his childhood with his child. Do you think his child feels the magic of the pier as Drake did/does? Does Stefanie accompany them on the visit to the pier? Guess you'll have to read the book! Every one's Summer time memory is different, but those that grew up going to the Jersey Shore know the emotion and memory of the boardwalk, beach, breezes, sunshine, night life, and that feeling of amusement rides. Don't miss out on the magic and visit the Jersey Shore this Summer, and read Magic Pier before you go to get a glimpse into the beach life. I was sent a copy of Magic Pier. The comments and views are my own.